The Burning Man Tour with Dierks Bentley is going to be the hottest ticket in the new 2019 year. 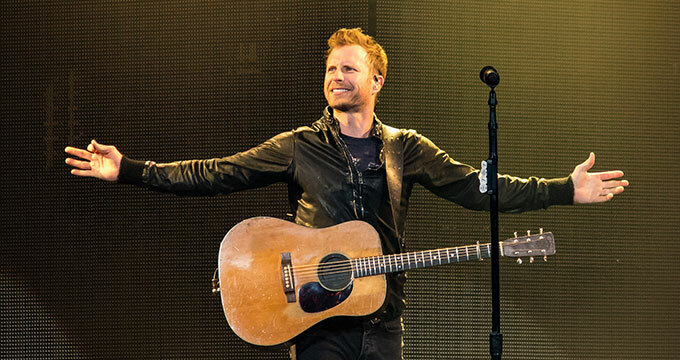 Dierks hasn't stopped performing in almost a year, he recently wrapped the Mountain High Tour, but after taking less than three months off, will be back at it again come January with new tour dates. The Burning Man Tour kicks off in Hamilton, Canada at the FirstOntario Centre on January 17, 2019. From there, Dierks will make his way through Canada, and then head to the United States in the beginning of February. The tour concludes in March at Van Andel Arena in Grand Rapids, MI. The Burning Man 2019 tour schedule will top out at 27 dates, where Dierks will perform tour setlist with the latest tracks from his most recent album, "The Mountain". Songs like "Burning Man", "Stranger to Myself", and "The Mountain" will be big hits to hear live. Dierks has topped the charts over seven times in his career, so changes are that you have heard to one of his songs, but if you are a new Dierks fan, or maybe you're tagging along with a friend, you may want to check out some of his past hits like "Am I The Only One", "Lot of Leavin' Left to Do", and more recently "Drunk on a Plane", though the songs are very different, they'll give you a taste of who Dierks really is, his deep voice will sooth your mind. Along for the ride on the Burning Man Tour 2019, we've got Jon Pardi, Tenille Townes, and Hot Country Knights. They will join the trek at almost all scheduled tour dates. The Head Over Boots singer, Jon Pardi, is the old school sound that country music seems to be lacking a lot of now a days. The typical pop laced music that you hear quite a bit on the country radio stations isn't Jon's style what so ever. The 30-year-old singer has been working nonstop, from writing, touring, and listening to what his fans want, so seeing him live should be quite the sight. Then there is Tenille Townes, who isn't just a pretty face. Originally from Canada, Tenille takes inspiration from Adele, U2, and many other non-traditional sources for her sound. The "Somebody's Daughter" singer is only twenty-four, but she's an old soul, her gorgeous melodies will have you tapping your feet in no time. Lastly, we've got Hot Country Knights tagging along for the tour dates, if you don't know about the Hot Country Knights, then boy you are in for a treat. This pseudo band is actually Dierks dressed up as his alter ego Douglas Douglason, clad in a mullet and light wash jeans. The Hot Country Knights will cover hits from today and yesteryear, like Alan Jackson's "Chattahoochee", John Michael Montgomery's "Be My Baby Tonight", and Sawyer Brown's "Some Girls Do" on the Burning Man Tour. It seems like Dierks really knows how to take a performance and make it hilarious and fun for everyone. Seeing him on tour in 2019 will be like one big party, there is no doubt that he will get the year started off right.